It’s not the puffins of Machias Seal that have the US and Canada fighting – it is what lurks in the oceans just beyond the island. On Christmas morning, Anthony Ross woke up on an island at the point where the Gulf of Maine meets the Bay of Fundy. Outside, the wind whipped across the frozen brown grass, blowing snow in drifts against the lighthouse while waves lapped the rocky shore. In the next room, his older brother Russell was already awake and keeping a watchful eye on the sea. It was not exactly how one pictures a family holiday, but for the lighthouse keepers of Machias Seal Island, it would have to make do. Once the helicopter lands on this 18-acre hunk of rock between the US and Canada, there is no going home until the end of the month. “You are away from home for 28 days at a time; that is the hardest part. But you get used to that,” said Russell, who has been a lighthouse keeper for about 20 years. Luckily, Russell and Anthony came prepared with turkey, presents and beer – all anyone needs for a nice Christmas day. After decorating the tree and calling their families back home in Nova Scotia, the brothers tucked into a roast dinner. “It was a pretty good Christmas, all around,” Russell recalled. Located smack-dab between the Canadian province of New Brunswick and the US state of Maine, Machias Seal Island is the only contested territory between Canada and the US on the East Coast. During the War of 1812, Great Britain (now Canada) and the US each laid claim to the land and the waters that surrounded it. Although the island is far too small and remote to be permanently settled, it was strategically located in the middle of a valuable shipping route, near Grand Manan Island (pictured), and neither country wanted to give it away. In 1832, Britain built a lighthouse on the island to physically stake its claim. Since then, Canadians have been living there, helping keep sailors away from its rocky coastline and protecting the land from both human and natural foes. That is where Russell and Anthony come in. As lighthouse keepers on the island, they are part of a long line of watchmen manning Canada’s frontier in the Atlantic Ocean. While most of the lighthouses in Atlantic Canada have closed, the government has kept this one open – in part to keep its claim on the rock. Neither brother works full-time – union rules say that part-time keepers can only work three month-long shifts a year. But one full-time position may be opening up, and both Russell and Anthony want to go for it. “May the best man win,” Anthony said with a smile. Both brothers have been doing this long enough to know the island’s rhythms: the way it fades from emerald green to dusty brown with the seasons; how the puffins swoop and cackle when they spot a fish in the water; and how the lobster boats emerge from the horizon just after sunrise. Russell and Anthony also play a role as unofficial ambassadors for the island, greeting American and Canadian tour boats that dock during the summer, when the island turns into a seabird sanctuary. They treat everyone the same, no matter their nationality, offering the birdwatchers a hand onto the slippery, seaweed-covered boardwalk. 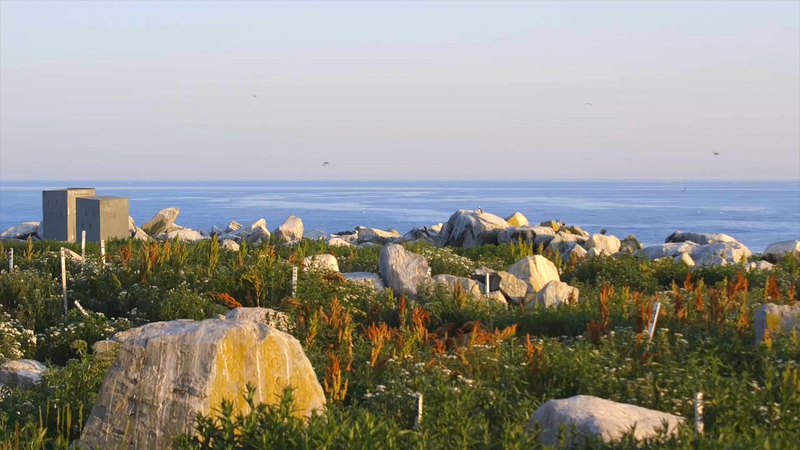 As island guardians, Russell and Anthony play an important role in protecting the thousands of seabirds – Atlantic puffins, common murres, Arctic terns and razorbill auks – that nest here during the summer. They help deter gulls that would prey on the young chicks, and also fend off one of nature’s biggest homewreckers: man. As one of the largest seabird colonies on the East Coast – and the most diverse – the island is protected by Canadian Wildlife Services, which limits the number of tourists allowed on the island at any one time. Only two tour boats, one from Maine and one from New Brunswick, are allowed to land each day on the island’s dock. With just 15 passengers per load, spots fill up fast. By early April, both boats have usually sold out for the entire birdwatching season, which runs from June to the first week of August. Those lucky enough to score a spot must make their way to either the island of Grand Manan in New Brunswick or to Cutler, Maine, where the boats are docked. It can be tricky for the vessels to land on the narrow and rocky shores of Machias, and bad weather can easily cancel a long-awaited trip. 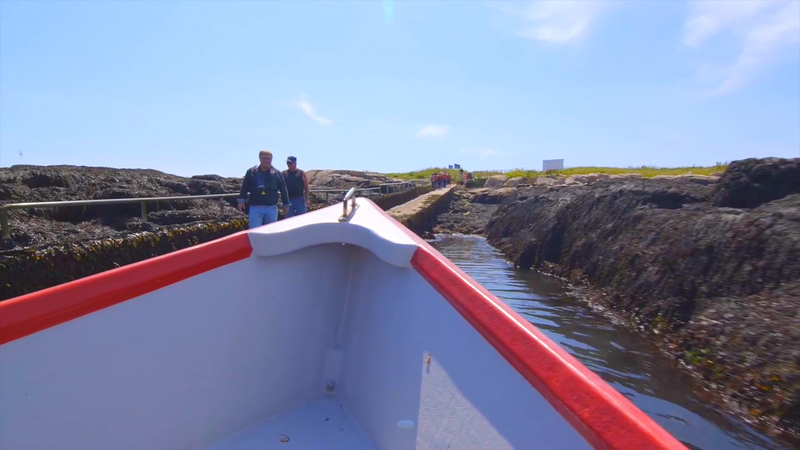 But if the seas are fair, adventure-seekers may see a pack of seals sunning themselves on a rock during the boat ride (which is two hours from Maine and 1.5 hours from Grand Manan), or even spot a whale. Once on the island, tourists are restricted to boardwalks to keep them from stepping on a puffin burrow. The skittish birds like to avoid the human interlopers, so people crowd into wooden sheds called blinds, where they can observe the pigeon-sized, tuxedo-wearing birds undetected. The hassle is worth it, according to Dr Tony Diamond, who has been running the University of New Brunswick’s Atlantic Laboratory for Avian Research (ALAR) since 1995. 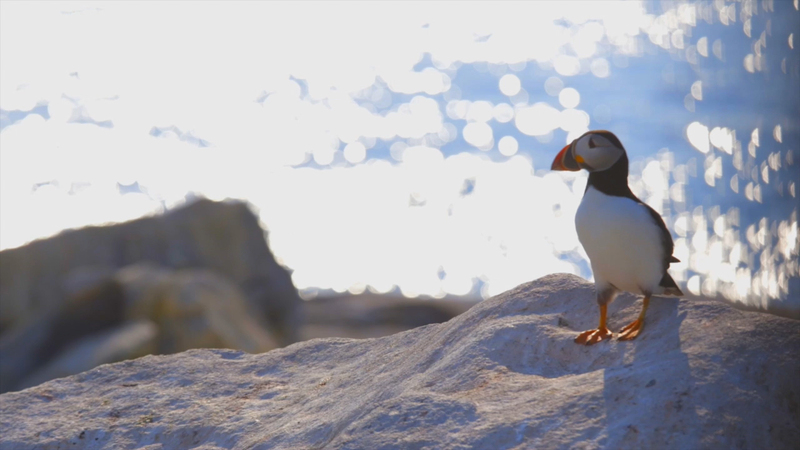 In May, thousands of puffins flock to the island to dig their burrows and lay their eggs. Once the eggs have hatched, mama and papa puffin take turns guarding the chicks and going out into the sea to bring back dinner. This process, which can last until about August, attracts birdwatchers, scientists and wildlife photographers from around the world. During the summer, three researchers from ALAR live on the island full-time to track and monitor the birds’ breeding season. It is a unique experience that helps scientists like Mark Dodds get a sense of not only the individual species, but how the ocean as a whole is doing. It is like a little snapshot into the life of a bird,” Dodds said. “Through them you get a really good look at the ecosystem. But it is not the puffins of Machias Seal that have the US and Canada fighting – it’s what lurks in the ocean just beyond the island. Over the past decade, the price of lobster has about tripled, with fishermen able to command about CAD$4 (£3) a pound for their catch wholesale. On a good day, a lobster boat can easily earn thousands of dollars. That makes the contested waters around Machias, nicknamed the ‘grey zone’, a veritable goldmine. Neither country wants to relinquish rights to fish those waters, so the fishermen have worked out a kind of unofficial truce. “Most of the time, if you try and work with them, they will try and work with you. But if you want to be a push and shove, you are going to be pushed and shoved back,” said Donald Harris, a fisherman from Grand Manan, a Canadian island of about 2,500 people located about an hour and a half, or 32km (20 miles), away by boat from Machias. On a lazy August afternoon, Harris and a couple of other fisherman are working on their boats out by the Grand Manan pier, taking it easy before the autumn season kicks in. 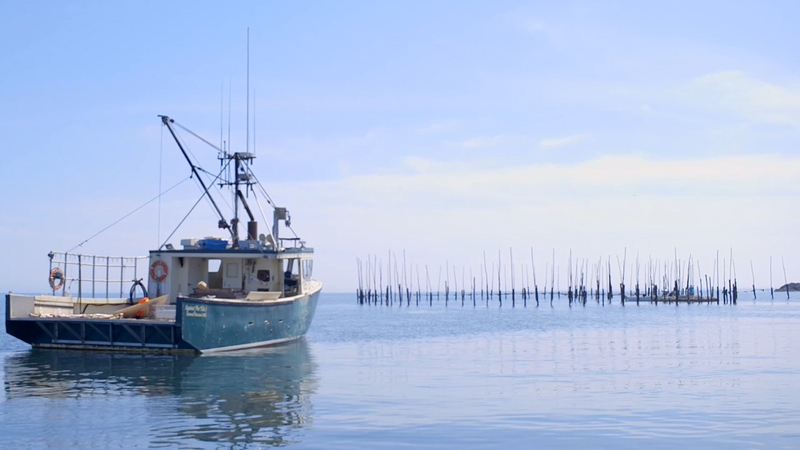 Practically everybody on Grand Manan is a fisherman or knows someone who is – the industry is the lifeblood of the community. The lobster boom is evident everywhere you go in Grand Manan, from houses decked out with fresh coats of paint to boats laden with the latest gear. “Lots changing. There’s a lot more people over here right now, there is a lot more stuff to do right now – our community’s getting better all the time,” said fisherman Dane Lynton. The ‘grey zone’ has only added to their wealth. Although the Canadian lobster season officially ends in June, in 2002 the government decided to allow year-round lobster fishing in the 700-sq-km (270-sq-mi) ‘grey zone’. It has helped tide many a fisherman over in the off season, and helped grow the lobster boom in Grand Manan even more. “That is just making money before we make more money,” Lynton said. But while many maintain that current regulations are enough to keep the fishery from being overfished, some are worried that the sky-high prices, driven by market demand in Asia, will prove too great a temptation. “Man can ruin anything, right? And greed will ruin a lot of things too,” Harris said. Although everyone is flush with cash for now, Harris has been around long enough to have seen the fortunes of the village go up and down with the tides, depending on what the catch is.